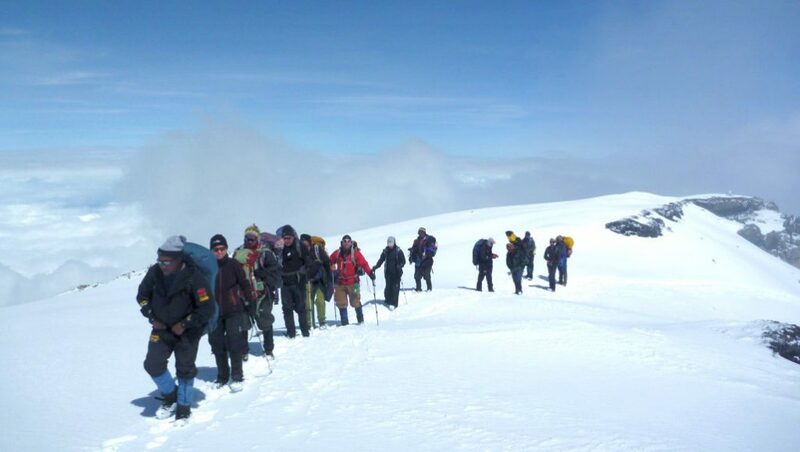 Are you planning the ultimate Kilimanjaro trek? Hiking Mount Kilimanjaro isn’t for the faint of heart, and only the most persistent adventurers make it to the top. But it’s because of this very reason that Kilimanjaro is the ultimate trek that attracts hikers from all over the world. Since it’s essential to prepare for a climb of this magnitude, having a cheat sheet on hand can help you stay focused on the safety measures, health concerns, and essential equipment that is most important, ensuring you succeed in reaching the summit without any setbacks. Here’s some of our ultimate Kilimanjaro cheat sheet tips to help you succeed. S.W.A.T. is Eddie and Amy Frank’s acronym for self-care on any outdoor adventure and is especially important for Kilimanjaro. All trekkers should be a member of the S.W.A.T. team for a healthy and enjoyable adventure. S is for SNACKS and that means regular snacking on GORP (good ‘ol raisins and peanuts), power bars, candy, nuts and dried fruit that keeps the calories on board. Calories are essential for energy and keeping hypothermia at bay in cold weather. W is for WATER as hydration is essential on a taxing trek. Your body needs water to survive. Every organ, tissue, and cell needs water in order to function properly. Your body uses water to maintain a constant temperature, remove waste, and lubricate your joints. Without this homeostasis, your trek is doomed. A is for ALWAYS CLEAN. Washing and/or disinfecting your hands keeps the bacteria at bay. Intestinal bugs are the bane of adventure travel and will quickly end your trek. T is for TEMPERATURE. Regulating your body temperature is essential to enjoying a healthy trip. If you’re too cold, you get hypothermic – end of trip. If you’re too hot, you get heat exhaustion – same result. Layering your clothing system, hydrating, and protecting from the direct sun are the key elements to happy trekking. Keywords in all caps can remind you how to do the most basic but overlooked things. BREATHE, SMALL STEPS, ENJOY THIS MOMENT, NEVER QUIT, THE JOURNEY, WEIGHT FORWARD, REST. When the going gets tough during the ultimate Kilimanjaro hike (in both challenge and reward), say these often and always STAY POSITIVE. Your guides and porters are a big part of why you summit. If you think you’re having a tough day on the trek, think about your porters who are carrying your stuff, yet always have a smile on their face. Adopt their can-do attitude and get to know these guys by learning some Swahili. On your cheat sheet, write a few Swahili words so you can communicate with them. Learn what Habari, Nzuri, Asante, Kwaheri, and Tafadhali mean and use them to make a new friend. Being mentally tough is going to be a big component to having the ultimate Kilimanjaro adventure. On your cheat sheet write a few motivational lines on why you want to get to the summit. For example, we’ve seen people who are on charitable hikes write, “for Mom” or “curing cancer.” Always remember that getting to the summit is more than just about you. The energy to get to the top can come from staying positive and not being singularly focused on you. All cheat sheet tips aside, you ultimately can’t cheat Mount Kilimanjaro. In all its looming glory, it will make an honest person out of you. There is no substitute for the tears and sweat you surrender in a true test of your endurance and mental toughness. But keeping these simple tips in mind will help you enjoy the journey and make it to the summit. So what do you say? Start planning your epic climbing adventure today.